Guest post by Andrew Breen, President at Outshine. The most useful thing I've learned over my career is that a brands’ data is the shortest and best path to better marketing results. Companies that have superior data have a competitive advantage. Easy to say, hard to do. Building up that database from events, partners, social media, and webinar attendee lists takes sweat, blood, and time. However, companies like Clearbit can help augment your existing data, bringing you closer to that advantage. This blog post will walk you through 5 ways to use Clearbit data to immediately improve your advertising and remarketing campaigns. At the enterprise level, there may be multiple definitions of what a good lead is (your ideal Customer Profile or ICP), but there is almost always consistent agreement on what a bad lead looks like. It may be defined by organization size, industry, or even existing tech stack. You can use that knowledge to filter out bad leads from your remarketing ads. It's an instant budget saver as you'll stop wasting money on visitors that won't ever become customers. To stop small businesses from seeing your remarketing ads in AdWords, create a custom segment in Google Analytics. With Clearbits integration in Google Analytics, you can augment your data with a wealth of useful company and contact information, in this case, Employee Ranges. Under “Advanced Conditions,” select Clearbit Employee Range = 1-10 or Clearbit Employee Range = 11-50. If your Google Analytics account is linked to your Google AdWords account, the audiences will show up under the “Audiences” tab. Add the audience to the Exclusion lists of your relevant campaigns. Using the same logic as above, but in reverse, you can use Clearbit to identify web traffic that fits your ICP. Then using “Similar To” or “Look-a-like” audiences in AdWords and Facebook, find more people that are similar. Suppose your ideal customer profile is a publicly traded company using Salesforce, Pardot, or Marketo. You can identify these visitors by applying the Company Type and Tech Stack filters in combination. Note the AND logic coupled with the “matches regex” used here. In B2B, the sales cycle is typically long and complex — the average spanning many months and multiple stakeholders. Prospects will visit the site dozens of times over the course of a purchase cycle, but unless they’ve filled out a form or signed up for a free trial, you won’t know anything about them. Clearbit gives you that critical data point that is otherwise missing when advertisers are assessing the quality of their traffic sources. With Clearbit, you can understand which ad platforms, campaigns, and ads (if you use UTM tags properly) drive visits to your website from your list of target prospects. More on that in the article How to Measure Your Account Based Marketing Reach. Now you can see what sources of paid traffic are most effective at driving visits from your ICPs, whether or not they convert. If you have enterprise wide clients, there is a good chance those existing users make up a considerable percentage of your website visitors. Use Clearbit Reveal to make a list of existing customers and treat visitors from these companies as a separate audience for remarketing. If your marketing budget and resources are limited, you can use this approach to negative match existing customers, while more mature Marketing orgs can serve existing audiences with different messages promoting new features, products, or content. Tests by Clearbit have shown that site visitors they identify in Reveal are of significantly higher value for B2B companies than traffic that is not identified. Outshine has seen the same results, both with conversion rates and goal value per visit. We have observed bottom of funnel offers converting 215% higher on Clearbit identified traffic versus unidentified traffic. Note: When reporting in GA, "Clearbit Company Domain" containing a "." indicates that Clearbit has found a result for that site visitor. If you also find that Clearbit identified visitors are more valuable that unmatched traffic, consider only retargeting to Clearbit identified visitors. The first challenge of using Clearbit for advertising is running into audience size issues. For remarketing lists to run in the Google Display Network, that list needs 100 active visitors or users within the last 30 days for your ads to show. The amount of segmentation you can do effectively depends on the amount of traffic that comes to your site. The second challenge is becoming overly focused on only ideal prospect traffic. 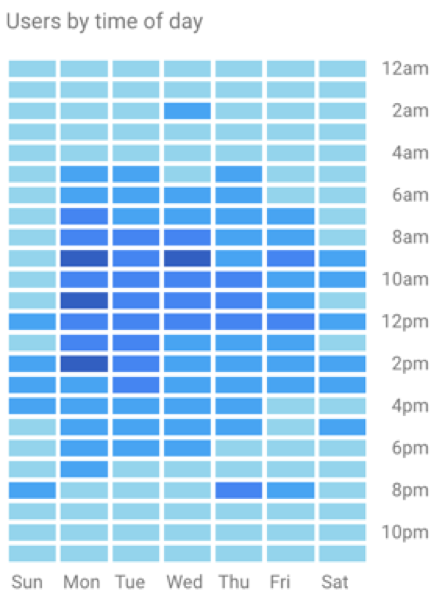 The majority of visits occur during business hours on weekdays, but people still research at home and on the go. And that traffic still has value. Don’t sacrifice the good in pursuit of only the perfect. Remember, not all valuable traffic will be revealed in Clearbit (but the most valuable will be). The third challenge of using Clearbit for advertising is the limitations that Google Analytics puts on custom dimensions. Google Analytics can only store 20 custom dimensions. Each company attribute you import from Clearbit counts against that limit, so you need to prioritize the most valuable attributes to your organization. Clearbit recommends the top 10 most valuable dimensions here, but you can see a full list of the 52 available company attributes here. 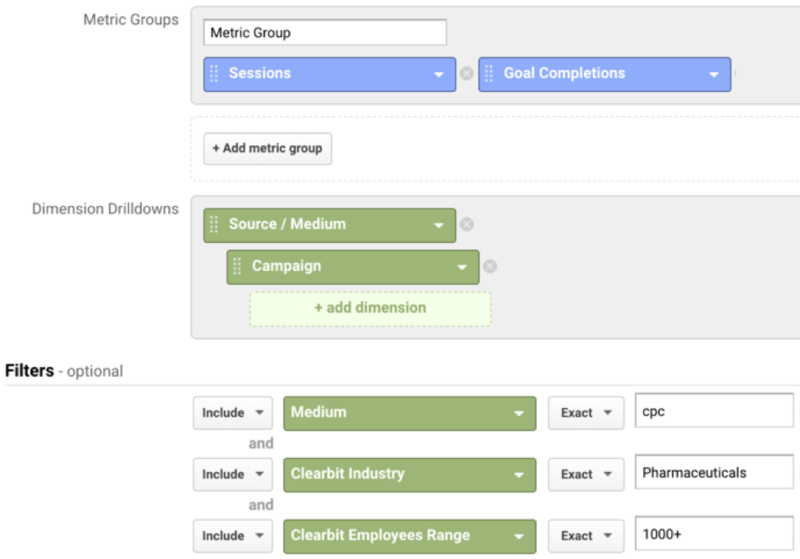 If you have already reached the limit of your custom dimensions, you may consider Google’s enterprise analytics solution, Google Analytics 360, which offers 200 custom dimensions. 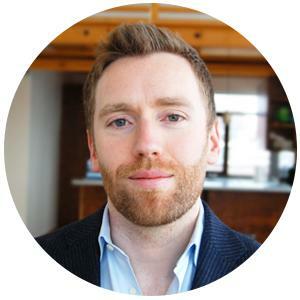 Andrew Breen is the president of Outshine, an advertising and analytics consultancy for B2B companies. Connect with him on LinkedIn or learn more at outshine.com. Based on your company size, location (USA), and technology stack, we think your company is a perfect fit for Clearbit!